Ethiopian Prime Minister Hailemariam Dessalegn Boshe has called for the academic community to enhance their research and contribute towards making the Belt and Road Initiative (BRI) and other cooperative vehicles more effective to serve the global community in terms of peace and prosperity. 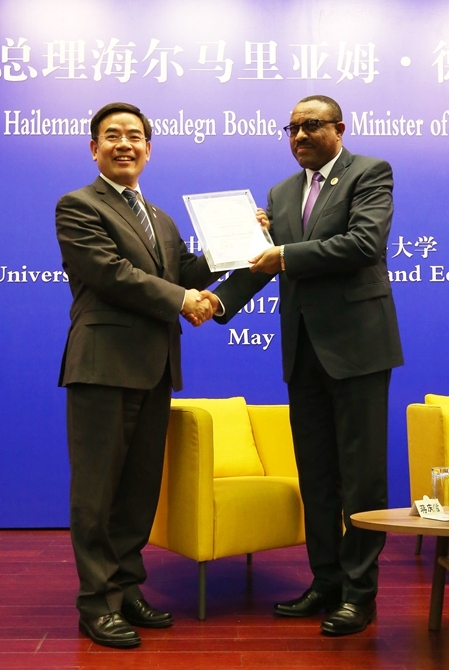 Hailemariam made the remarks on Sunday while addressing students and staff of the Beijing-based University of International Business and Economics (UIBE), where he was awarded an honorary professorship. Hailemariam was in Beijing to attend the two-day Belt and Road Forum for International Cooperation opening on May 14. "The Belt and Road Initiative, unique and visionary, is an all-time initiative," he said. Through it, China is advocating an open and win-win approach to economic cooperation. Ethiopia is willing to be part of this vision, he added. He said that he believes the forum and discussions will help to further strengthen cooperation in human resources development between the two countries. Currently there are dozens of Ethiopian students, including Second Degree and PhD students, studying at UIBE. The Prime Minister expected the numbers would see a sustainable increase in the future. In the next five years, China will offer young foreign scientists 2,500 short-term research visits to China, train 5,000 foreign scientists, engineers and managers, and set up 50 joint laboratories with countries participating in the Belt and Road Initiative to enhance cooperation on innovation, according to the statement by President Xi Jinping in his keynote speech at the opening ceremony of the Belt and Road Forum. Hailemariam pointed out that China was taking an historic and unprecedented step in providing an opportunity for greater connectivity in policy coordination, infrastructure, trade, finance and people-to-people exchanges across the globe. The Ethiopian economy has registered an average annual GDP growth rate of 10.9 percent for last 13 years, the fastest growth for non-oil economies in the world, according to the Prime Minister. Xi proposed the upgrading of bilateral ties to a comprehensive strategic partnership of cooperation to reflect the "strategic aspect and the high level of political mutual trust of the bilateral relations" when meeting with the Prime Minister on May 12. Hailemariam cited a Chinese saying that "with clothes, the new are best; with friends, the old are best," and concluded that age-old China-Africa friendship is standing firm and continuously flourishing.